I recently upgraded my ballhead to an Arca-Swiss Monoball Z1 sp. First impression – I really liked the Z1 ballhead. It's a very solid piece of equipment. One thing I didn't like, however, was Arca-Swiss's newly re-styled quick release clamp. Therefore, I decided to purchase a Really Right Stuff BS-AS II clamp instead. When my replacement clamp came, I prepared to disassemble the Z1 clamp using a wrench and an appropriate hex bit. Using a reasonable amount of force, the bolt didn't budge. I steadily increased pressure until the wrench began to rotate. When I disengaged the bit from the bolt, I noticed that my bit looked like the beginnings of a corkscrew. The bolt had never loosened; instead, the bit had failed (and was ruined). Not wanting to accept defeat (and reality), I thought I'd give a regular allen (hex) wrench a try. Nada. I used so much force that the allen wrench began to twist in the bolt. "Alright, " I said to myself, "...something's not right." After a call to the US-based Arca-Swiss Representative, I learned that Arca-Swiss is now designing their heads to feature "non-interchangeable" quick releases. They're using an epoxy/glue to solidify the assembly bolt in place. The only "official" way to replace your clamp (and keep your warranty intact) is to send it to Precision Camera Works in Chicago, IL, the only authorized service center for ARCA-SWISS ballheads in the United States. There is a flat fee of $30.00 for replacement. When customers replaced their QR clamps, some of those "Arca Style" clamps were actually incompatible with Arca-Swiss's own plates. Therefore, Arca-Swiss was losing plate sales. Some customers were actually damaging their heads when replacing the QR clamps. Warranty claims submitted from these replacement attempts were "...quite expensive." A third-party manufacturer had produced a "lever-release" style clamp that was similar to Arca-Swiss's design. The third-party manufacturer was able to do this because of a patent filing error on Arca-Swiss's part. Arca-Swiss decided to stop "subsidizing" the third-party company by introducing barriers to customization. First off, I'm not a fan of "closed systems." I don't appreciate it when a company makes it more difficult for me to customize a device for my own use. I understand Arca-Swiss's desire to capitalize on their product line. They developed a support system that has become an industry standard; it really is superior to everything else I've seen. However, if people are consistently trying to replace Arca-Swiss's current QR clamps with a competitor's product, what does that say about the current QR clamps that Arca-Swiss offers? Instead of forcing consumers to keep the OEM QR clamps by introducing barriers to change, why not win them over with a design that leaves customers ultimately satisfied with the OEM clamps as-is? In the end I decided send my ballhead to Precision Camera Works for the QR clamp replacement. The Z1 is a truly remarkable ballhead and the one I want to be using for the foreseeable future. That said, I want it my way. 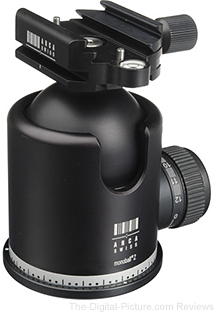 B&H carries the Arca-Swiss Monoball Z1 ballheads. Adobe Photoshop CC Update Adds "Perspective Warp"